And other. Should the companies be required to include such messages? User voted Yes; big front messages. These should be the messages showing the consequences of smoking. Currently this messages are being shown in Uruguay, a country of South America. 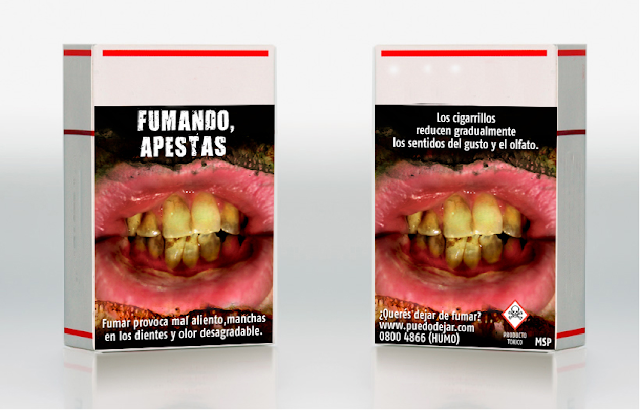 Image says "By smoking, you stink, smoking provokes stains in teeth and awful smell. Cigarettes reduce gradually the senses of taste and smell"
Why, is that anyone who doesn't know smoking is bad for you? Beside we already have warning, PSA's, bans on smoking, etc. If you really think smoking is that bad, have the government ban tobacco, oh wait the GOVERNMENT gets a ton of cash from smokers, and since they tend to die sooner they government doesn't have to spend as much on SSI, so you know that's not going to happen. At: cigars, smokeless tobacco, tobacco producers, tobacco manufacturers, cigarette manufacturers, cigarette companies, cigar companies, debate, forum.